***GREAT GULF VIEW/PRIVATE POOL*** This Beautiful custom built home is located in the Sea Grass neighborhood on Cape San Blas. 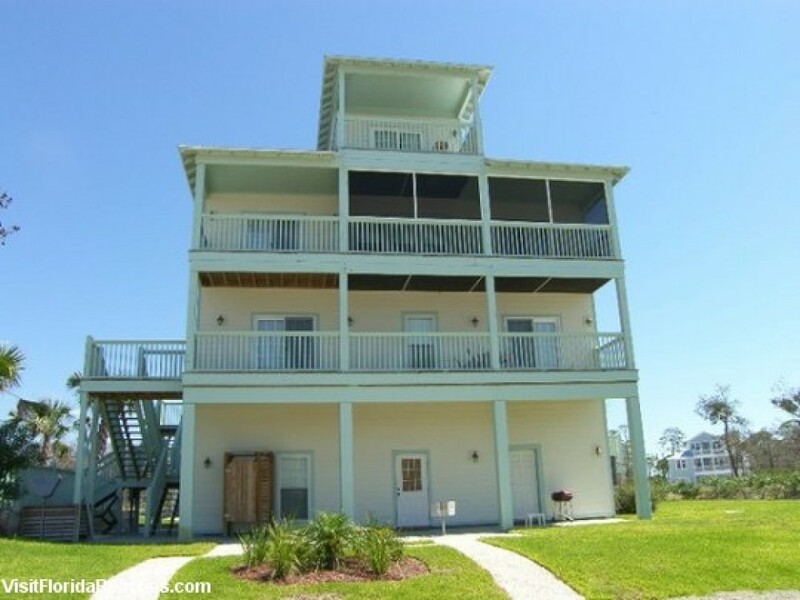 Sea Grass is a newer gulf front community that has its own pool and club house. In addition, this home also has its own private pool. BAREFOOT ESCAPE is the perfect home for a large family or two families as it has 4 separate living areas. It also comes complete with a Wii Gaming System, ping pong table, foosball table, beach chairs, floats and toys for everyone to enjoy along with a tandem bicycle and golf cart (Security Deposit required). Pets are welcome at Barefoot Escape as well as on the #1 Pet Friendly Beach, Cape San Blas. The house is decorated in a beach cottage theme and a great place for your next vacation. Other amenities include Wireless Internet, garage parking, outdoor shower and parkside grill. Floor Plan: Ground Level-off the pool has a living area with a futon, TV/VCR/DVD and large bath. First floor-Bedroom 1-King bedroom with gulf view balcony, walk-in closet, TV/VCR/DVD and full bath with double vanities and a shower stall; Bedroom 2- twin bunk set, a twin captains bed, gulf view balcony and full bath with shower/tub; and a full-size laundry room with utility sink. 2nd Level-Large spacious living area with great gulf views off the surrounding decks, a portion being screened; a bay view balcony; kitchen and dining. The living room has a queen sleeper sofa, great gulf view, TV, VCR/DVD and Wii. Bedroom 3-large King bedroom with full bath, gulf view screened porch, TV/VCR/DVD and walk-in closet. 3rd Level-Loft painted with a beautiful beach mural with a day bed and trundle, sitting area and TV/DVD/VCR. Off of the 4th level is a gulf viewing deck with breathtaking views. There is also a twin rollaway to make this house sleep 14.